A swimmer, then attentions turned to softball competing at provincial level, next on the list, Ashlyn Wagner turned his attentions to table tennis; he became the national Under 15 and Under 18 Boys’ Singles champion. However, he grew up in the era of apartheid, the policy of racial segregations which was officially banned in 1994; coloured, he never had the opportunity to represent his country on the international stage. Aged 16 years, he started coaching table tennis and later gained a University Degree in Sports Science; in 2013 he assumed the post of national coach. 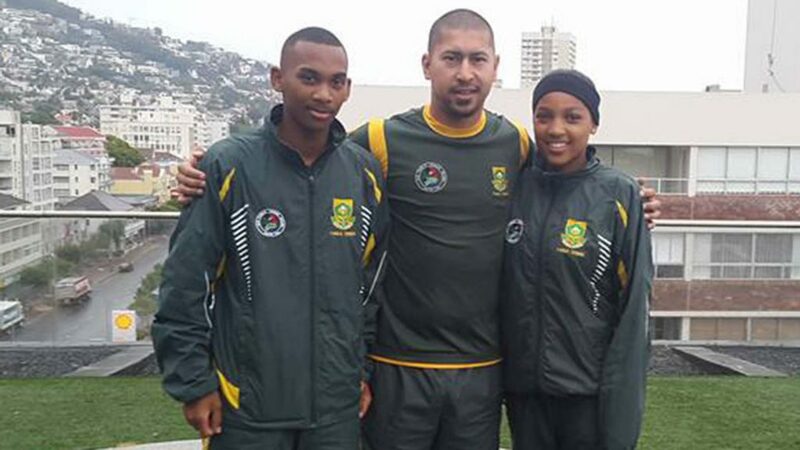 At the recently concluded Sun International 2016 World Junior Championships in Cape Town, Ashlyn Wagner was the man in charge of the South African Team; it is an opportunity he has greatly valued. He spoke to Olalekan Okusan, the Press Officer for the ITTF-African Table Tennis Federation. I come from a family of sports people. My family were all South African swimmers, softball players and coaches but they also gave it a go at table tennis. My parents bought my sisters and myself a table tennis board for recreational purposes and the addiction started in our garage. We joined Livingston table tennis club 30 years ago and now I am playing and coaching at the Stephanian table tennis club. Also I have been the South African table tennis coach since 2013 and I was part of the team at the 2013 African Junior Championships in Tunisia. Competing at the World Junior Championships I noticed that we still have a long way to go but I am sure that anything is possible; our players must work at their game and believe in themselves. Their attitude is also vital; they must be motivated and have self-discipline. There are very important aspects for success because I believe our players have the talent and they just need to put in the hours and work in with the support, of course, from our South Africa Table Tennis Board and government. What I enjoyed about hosting the World Junior Championships was that my fellow countrymen, coaches and players could witness world class table tennis and they could see for themselves what I was trying to tell them. They could see it for themselves at first hand. Table tennis venues and resources are major challenges. We do not have proper table tennis venues that are available regularly anywhere in South Africa. Therefore our players are not getting in the proper amount of hours. We have dedicated and very good coaches in our country but not enough support from government and sponsors. Table tennis is a very expensive sport and the majority of our players come from disadvantaged areas. We have to pay for the hiring of venues as well as pay for equipment which they cannot afford. We also lack regular international exposure. Our players always take a while to adapt to international level. Some of the players have the capabilities to do well by taking some games but lack international composure, match play and the temperament to finish off a match. Byrone Abrahams and Lekeasha Johnson are prime examples. They can compete and play well but cannot finish off their matches because of inadequate international exposure. Those are just some of my challenges but they are many more. I think that some of our players are not technically sound yet and a lot of it has got to do with how they are taught and trained at grassroots level, some incorrect and bad habits are creeping through. Within the next two to three years, our first goal is to medal at the African Championships and I believe we are almost there. Our aim is to build our juniors within our own country and make our competition and pool of juniors strong within our own country. Once our pool of juniors is strong, our next aim is to compete and do well in Africa and then qualify for World Championships.